4487 ✉ U26 \"KIENITZ 16 / 7 / 63\", two ring cancel in very rare red-brown mixed color on district 1 Sgr. Red (Michel no. U26) to Berlin, expertized Brettl BPP. Stamp rarity! 4477 FDC 6a 1 Sgr. 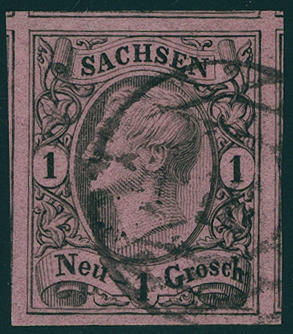 Rose, horizontal strip of three fresh colors, on all sides good margins, left slightly touched at bottom, right lower corner was refolded, right above small tear, on decorative, sensational First Day Cover with two clearly number cancel \"184\" left little by spotted, as well additional rectangle cancel \"BRESLAU OBERSCHL. BAHNHOF 17.4. 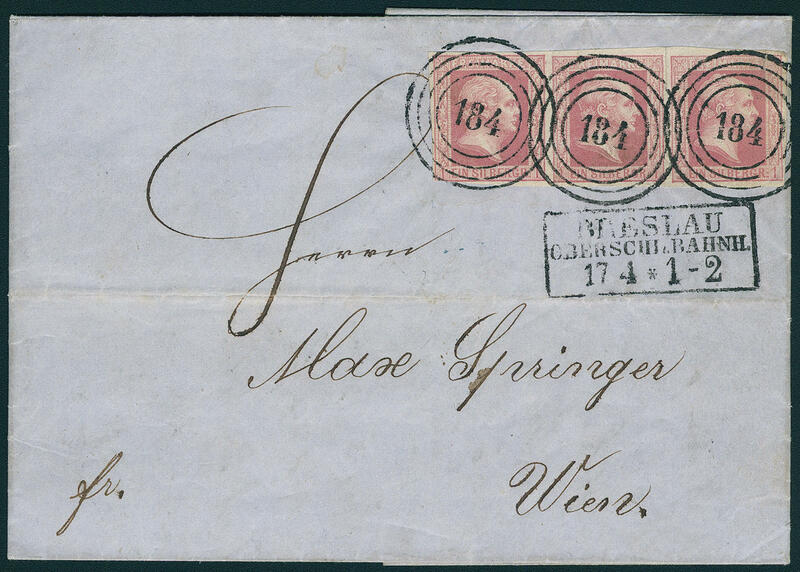 (1857) \" to Vienna with arrival postmark. The cover is inside dated \"Wroclaw 17. APRIL 1857\" with complete text. 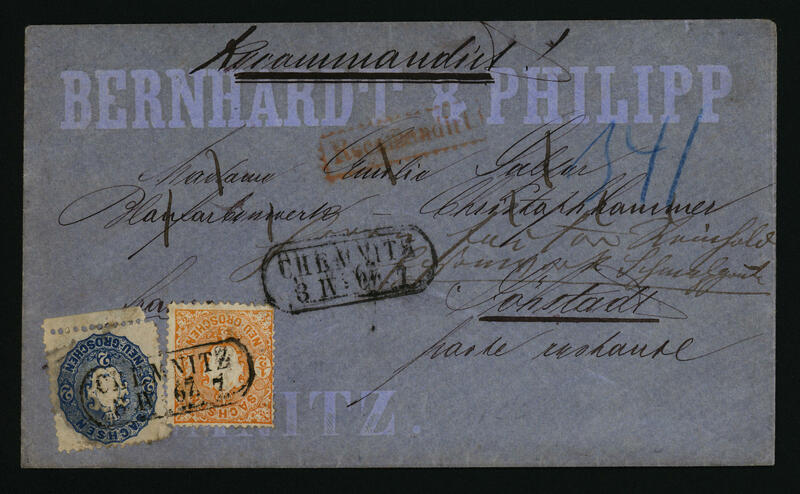 First-Day-Covers belong to the large rarities from Prussia. As multiple franking seeming unique and an especially decorative copy and a Honor for the large special collection! Photo expertize Flemming BPP. 4478 ✉ 6a,Han.8b 1 Sgr. Rose, wonderful fresh colors, dwarf cut, with clean mounted number postmark \"596 (HEILIGENSTADT) \" to Dingelstädt as printed matter used. The cover is double used. He was previously already as printed matter used with Hanover 3 pennies as wonderful having bright colors and good margined outstanding quality with rectangle cancel \"Hanover 23. January\". In this kind a magnificent \"two countries combination\" and a Honor for the sophisticated exhibition special collection! Photo expertize Berger BPP. 4479 ✉ 10b 1 Sgr. Carmine rose, wonderful having bright colors, on all sides full- to piece in outstanding quality with enormous margins on beautiful, small-format stamped ornament letter with colorless border ornaments in the local usage used with perfect, pricked clear rectangle cancel \"GENTHIN 21.7. 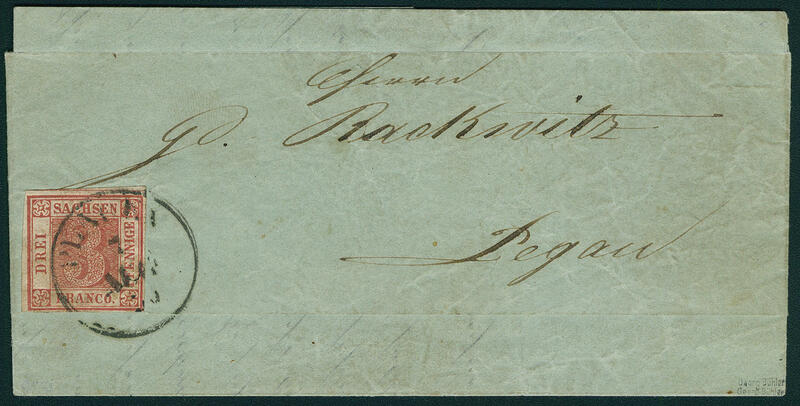 \" and additional handwritten notation \"with ordering money\" and on the back issue cancel of the same date. A dreamlike nice ornament letter in perfect quality. Verso decorative colored paper seal with floral design. Obviously has a worshiper his lovers lady a love letter transmits and on each detail minded. 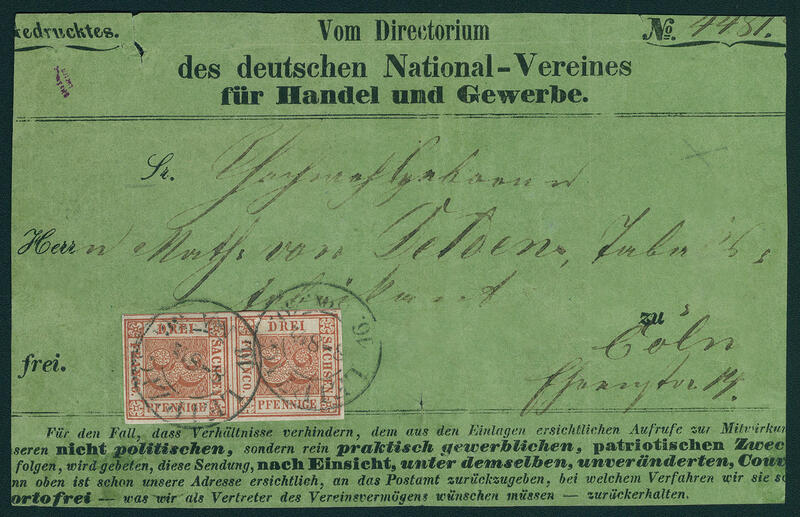 A dream letter the Prussia philately and in combination with the paid ordering money seeming unique! 4480 ✉ 11a,16 2 Sgr. 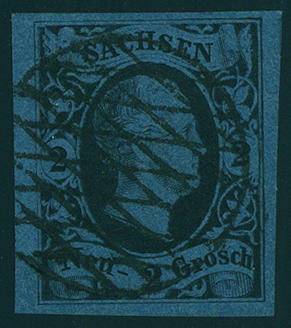 King Friedrich Wilhelm IV., gridded ground, single and horizontal pair, fresh colors and on all sides having full to wide margins in mixed franking with 1 Sgr. Coat of arms on cover with railway mail three line \"WARBURG-DÜSSELDORF 3.11. 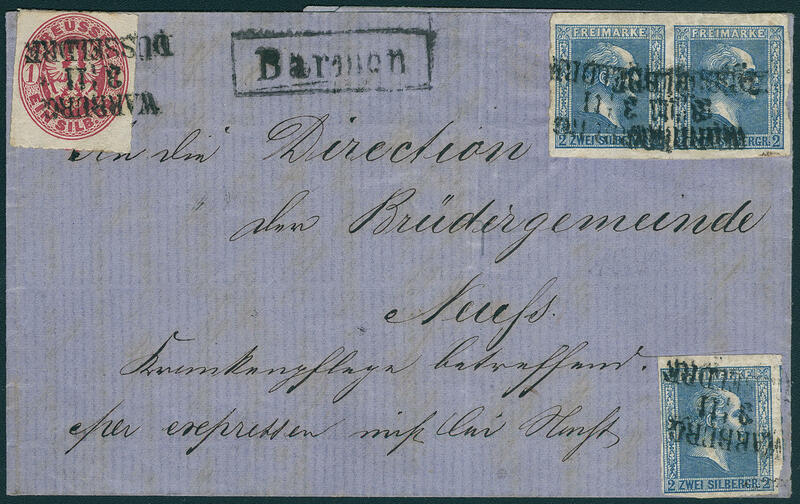 (1862) \" with additional station rectangle cancel \"BARMEN\" to Neuss. The cover was as special delivery transported (handwritten notation \"PER Expresses\"). An absolutely extraordinary interesting and in this kind unique special delivery letter per railway mail with an extremely unusual franking combination. 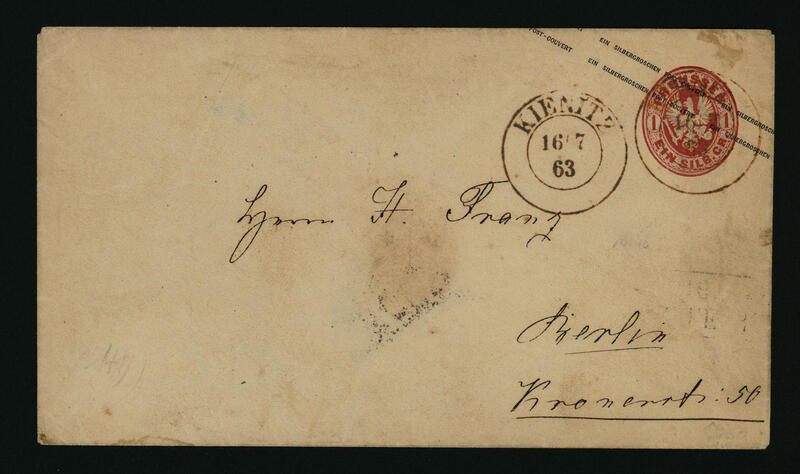 4481 ✉ 18a Prussia franking from CONSTANTINOPEL: 3 Sgr. 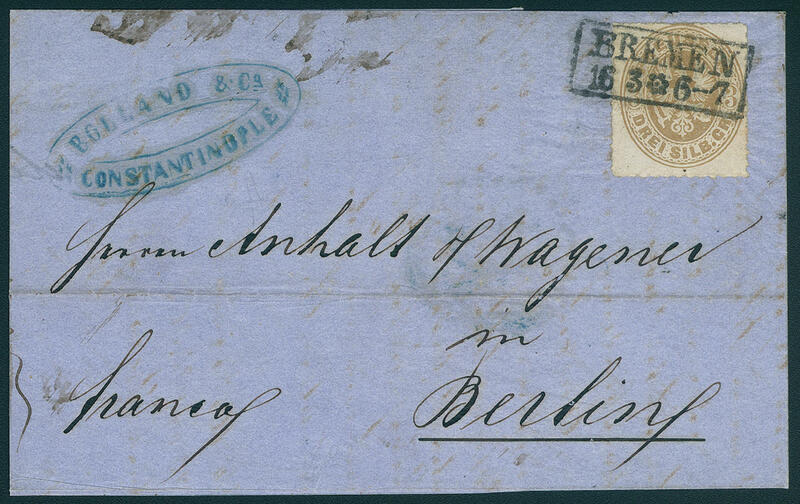 Pale brown, fresh colors and in perfect condition on attractive small-format cover with clear box cancel of 2 lines \"BREMEN 16.3. 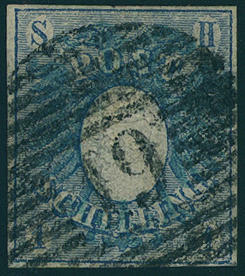 (1865) \" to Berlin. 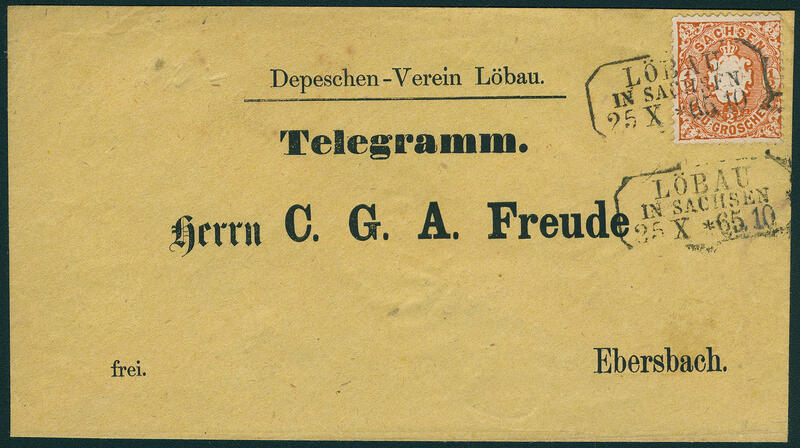 The cover was in Constantinopel at the 7.3.1865 written and to Bremen transported. First there was he of the postal service hand over. 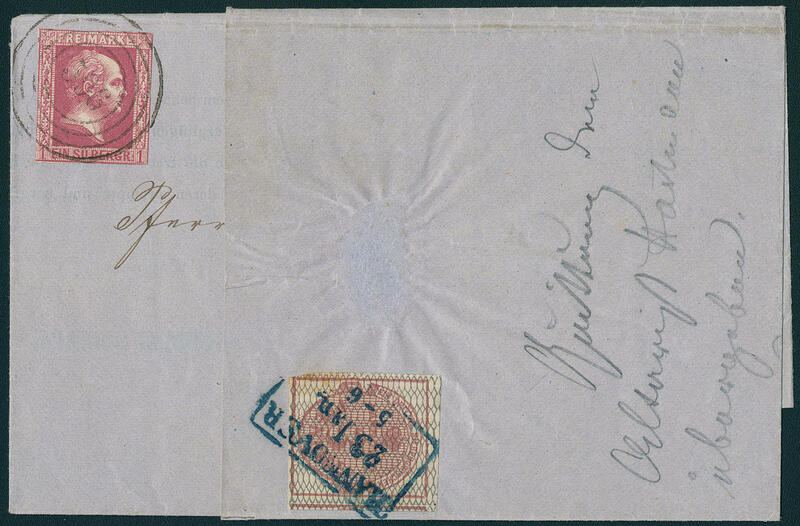 The cover carries reverse the mailing note and on face the senders mark from Constantinopel. In this kind a postal history interesting, possibly unique cover for the sophisticated Prussia respectively Bremen special collection! 4488 ⊙ 1a 3 Pfg. Bright red, having bright colors copy this famous Saxony Dreier, corrected, with clear two ring cancel \"DRESDEN\". A very attractive copy this sought-after Old Germany rarity! Photo certificates Rismondo BPP, Vaatz BPP. 4489 ✉ 1a 3 Pfg. 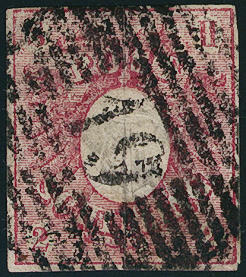 Bright red, vertical pair, wonderful fresh colors and large margins all around in outstanding quality (a tiny abrasion of color at the upper stamp is irrelevant) on front of an address wrapper of the Directorium of the German national association for trade and commerce to a tobacco manufacturer in Cologne with two clearly two ring cancel \"LEIPZIG 16. November 50. \". The document is correct franked for a printed matter the 2. Weight step within the Postal Union. A spectacular and famous Saxony rarity. This already adorned the collection of the greatest stamp collector of all time Philipp La Renotiere from Ferrary, as well the collection of the largest Old German States collector John R. Boker. For the Saxony rarity offered here were on a Boker auction the 80s years 57500,- DM paid. Photo certificates Royal Philatelic Society / London (1968) and Vaatz BPP (2018). 4490 ✉ 1b 3 Pfg. Cerise, by far the rarest colour of the legendary Saxony Dreier, wonderful fresh colors and good margins in utterly perfect condition on complete printed matter with neat postmark \"PLAUEN 7. August 50\" to Pegau. One of the most beautiful known really perfect specimens of this important Old Germany rarity and also in rare early use. An outstanding piece of the top class! Photo expertize Rismondo BPP. Michel 40000,- €. 4491 2IIa 3 Pfg. Dark blue green, later edition, wonderful block of four, wonderful fresh colors, on all sides good margins with complete original gumming, in perfect condition unused. Unused blocks of four of this issue are very rare, whereby it be here about of an of the most beautiful known examples act! Photo expertize \"perfect quality\" Rismondo BPP. 4492 ⊙ 2IIa 3 Pfg. 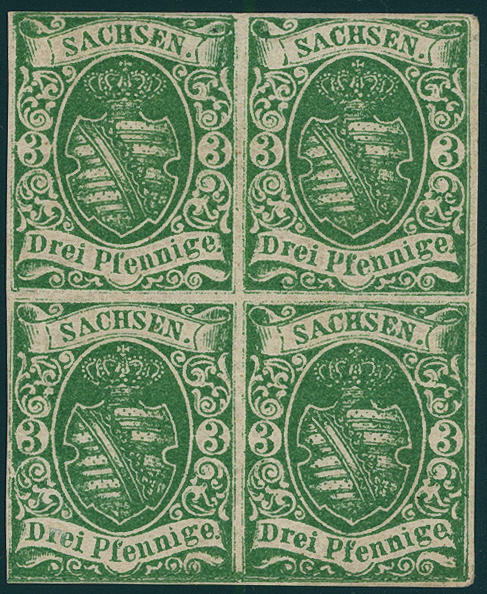 Green, later edition, horizontal strip of three fresh colors and good margins, at the bottom with parts the neighbour stamps, with clearly number cancel \"2 (LEIPZIG) \". An outstanding quality this very rarely unit for the highest standards! Photo expertize \"perfect quality\" Rismondo BPP. 4493 ∆ 2IIb 3 Pfg. Green, second edition, vertical pair, wonderful fresh colors and good margins with clear embossing on piece with Nrs. \"11 (ALTENBURG) \". A very nice copy! Photo expertize \"faultless condition\" Rismondo BPP. 4494 FDC 3b 1 ½ Ngr. Black on dull greenish gray, wonderful having bright colors and on all sides piece in outstanding quality with enormous margins with clean mounted first day cancel \"Yew cane 1. August 51\" on beautiful small-format First Day Cover with especially decorative written destination address to Wolkenstein in dreamlike nice condition. Sender adress is the deaf-mute painter Karl Friedrich Groß, who complains about outstanding aid payments promised to him. The cover is from sender adress on the 1. August 1851 dated. 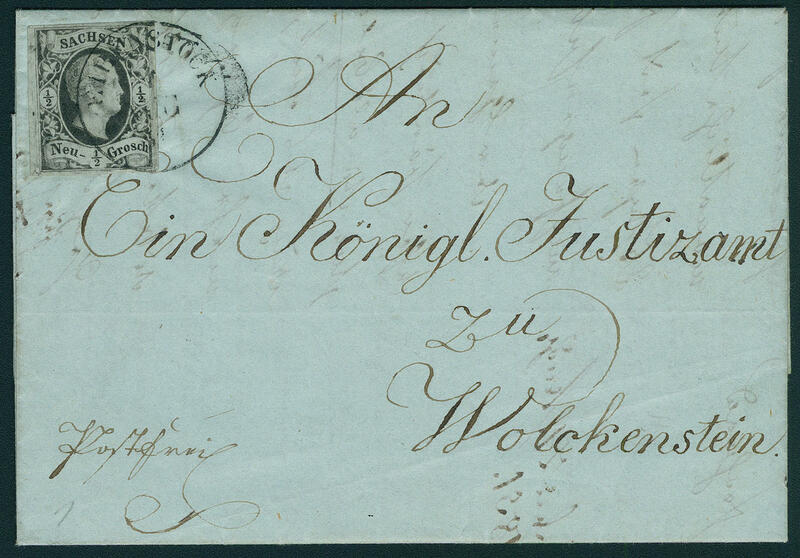 One of the most beautiful known first day covers from Saxony for the highest standards! Provenance: Ex collection Springer. Photo expertize \"genuine and immaculate\" Vaatz BPP. 4495 ⊙ 5 2 Ngr. Black on blue, wonderful having bright colors, on all sides piece in outstanding quality with enormous margins with centered, clear full grid stamp, expertized Pröschold BPP. 4496 ⊙ 9IIa 1 Ngr. King Johann I., type II, having bright colors, on all sides enormously with enormous margins used outstanding quality with parts from five neighbour stamps. 4497 ✉ 15,17 1 / 2 Ngr. Orange and 2 Gr. Blue (faults) on registered company printed form letter \"BERNHARDT & PHILIPP CHEMNITZ\" with box cancel of 2 lines \"CHEMNITZ 3. IV. 67\" to Jöhstadt \"POSTE RESTANTE\" and forwarded. Extraordinarily rare! 4498 ✉ 15a 1 / 2 Ngr. Red orange, having bright colors and good perforated outstanding quality on very nice, preprinted telegram envelope of the private dispatches Unite Löbau with rectangle cancel \"LÖBAU IN Saxony 25. X. 65. 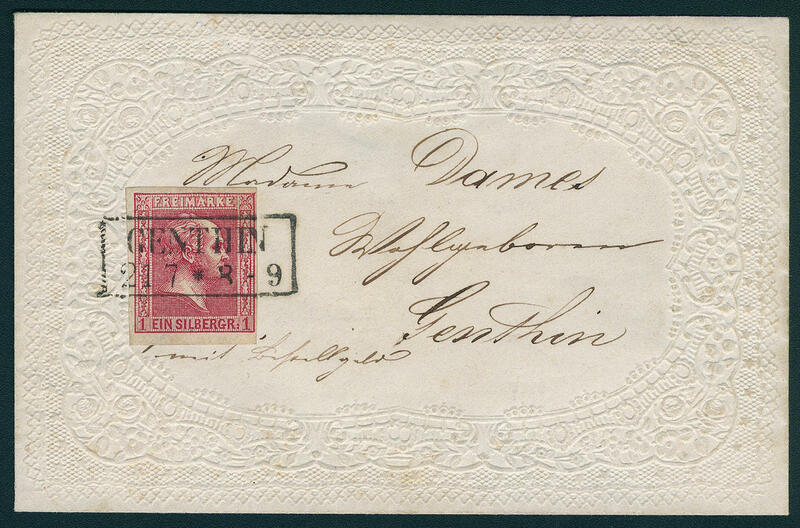 \" as normal cover transported to Ebersbach. Extraordinarily rare, whereby it be here about an especially nice and extraordinary copy act. Photo expertize Rismondo BPP. 4499 ⊙ 1a 1 Shilling blue, wonderful fresh colors with very nice embossment and on all sides good margins with very nice clear centered number postmark \"19 (KIELER railway station) \". An outstanding quality this Old Germany rarity! Photo certificates Hans differently (1965), Wolfgang Jakubek BPP (1994) and Möller BPP (2017). 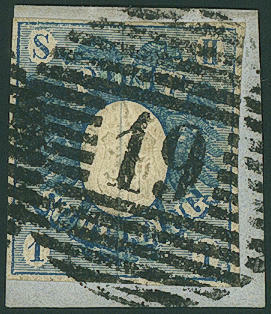 4500 ∆ 1a 1 Shilling blue, wonderful fresh colors, large margins all around on piece with especially clear mounted turning into number postmark \"19 (KIEL railway station) \". An outstanding quality this Old Germany rarity for your highest requirements! Photo expertize Jakubek BPP. 4501 ⊙ 2a 2 Shilling rose, wonderful fresh colors and good margins with centered clear Nrs. \"19 (KIEL railway station) \". 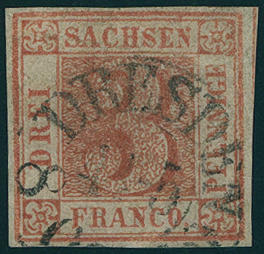 An exceptional nice copy of this stamp, the in perfect condition to the Old German States rarenesses counts! Photo certificates Pfenniger, Jakubek BPP.